Yes, you read that right – 11 hours of gaming spread over 2 days – completely unheard of! 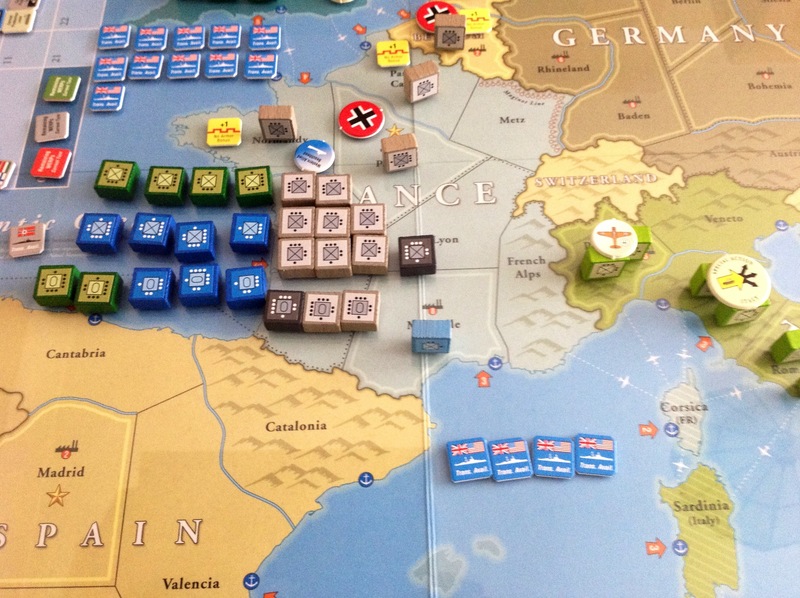 Europe Engulfed has been on our to-do list for many years, but time and inability to leave a game set-up longer than overnight has always got in our way – but not any more. We played the 1941 scenario which is recommended for first timers because for the Germans it would be challenging to do as well from 1939 in the game as they did historically. We had played an introductory scenario a couple of years back which excluded the whole strategic warfare part of the game, so we were keen to include this aspect to see what impact it had. Playing the Germans, I got over the Dnepr but didn’t make it to Moscow or the Don before mud and winter set in, so I only conquered 2 areas which gave me resources to add to my total for strategic warfare. The Russian build up is spectacular, and the rule which causes each Axis infantry unit in Russia to lose a step in the first winter really hurt – try as I might (and even both forgetting to impose the Russian fighting in snow advantage) the advance ran out of steam while the Russian build up seemed unstoppable. The Ploesti oil resource is vital for the Axis replacement schedule in the game and as the photo above shows, the Russians were only one space away from it when we had to finish in May/Jun 1943. The pieces face up in the top left are set out to fight a battle on the Russian border and you can see how outnumbered the Axis are, so the loss of Ploesti is almost certain. As a newcomer to the game, I used Special Actions to move and fight extra combats in my first couple of turns. Basically, Special Actions are purchased with the resource points generated by areas as part of the strategic warfare phase and cost 5 each, and the Germans can have up to 5 of them in the early game. Amongst other things, these can be used to move and fight with units who have already been activated this turn, giving you extra turns with these units to attempt to push an advantage or follow up a breakthrough. What I didn’t do was declare assault combats where both the attacker and defender numbers of dice are doubled, but as the defender rolls first the attacker will take losses before he gets to roll. I thought this was more useful for the Russian player who seems to have infinite resources, but maybe I was wrong and should have risked more in this initial phase of the game before the U.S.A. The Allies landed in France on the Sep/Oct 1942 turn at Bordeaux thinking it would be a bit of a distraction from the Russian Front for the Germans, but it went surprisingly well and the fledgling Atlantic Wall with a 4 step SS Panzer block failed to stop them on the beach (my dice rolling was as reliable as ever…). Although the British and American troops never broke out from the beachhead they were a drain on troops destined for the East so achieved their purpose even if they were costing double to supply. 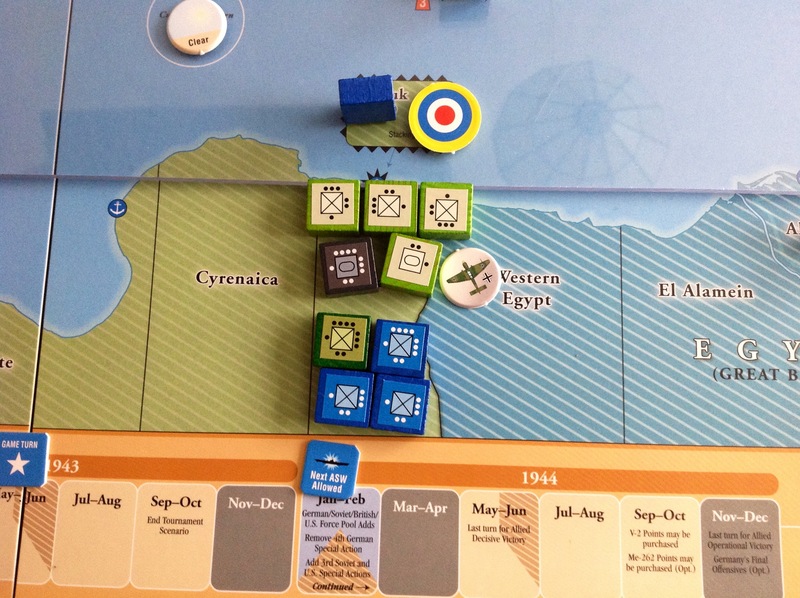 The supply was achieved by naval fleet points which are the blue counters in the English Channel – another aspect of the strategic warfare which the Germans were way behind in, though through the Italians they had naval parity in the Med. The economic warfare is handled abstractly by spending production points on U-Boats, bombers and fighters then conducting air raids, attacks on convoys and anti-submarine warfare for the whole turn in a few die rolls. Simple, but it works very well (except when the Germans roll 1’s for convoy attacks several turns on the trot!). The Allies can upgrade their anti submarine warfare once per year which means the war on the U-Boats will eventually go their way, but the U-Boats can hurt Allied resource production depending on how well they roll. With Allied fleet production happening every other turn against German and Italian fleet production happening once per year, I was rapidly outclassed in the Atlantic and any attempted intervention in beachhead supply lines by the German navy would have been suicidal. 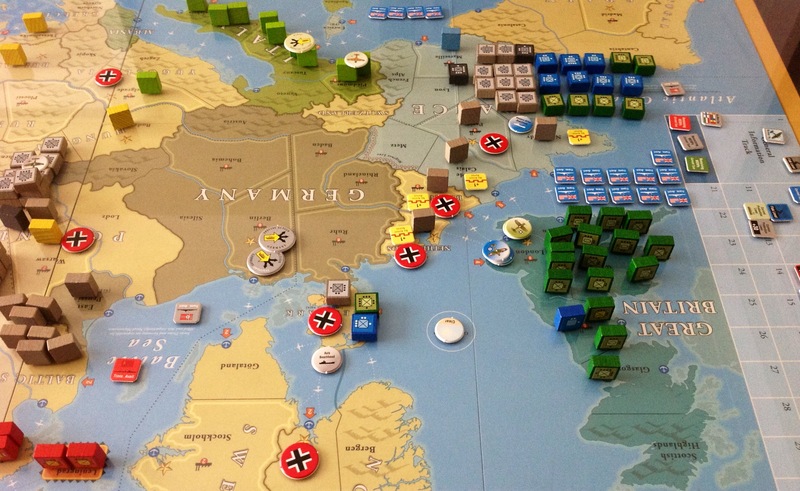 We both liked the strategic war side of the game – abstracted to be sure, but quick to resolve and giving believable results. What did disappoint was the length of time it took to play. We played 12 turns of 1941 Scenario in 11 hours but there were still 15 turns left to play until the game end. OK, I was beaten as the Germans by this stage and it did look like just a matter of a few more turns before the inevitable collapse, but we would both have liked to reach a more definite conclusion. So why did it take so long? Battles (especially the massive ones on the Eastern Front) slowed the game down a lot because of the number of dice we were rolling (50+ in some cases). There is a chart supplied with suggestions on how to cut down on the number of dice rolled, but we didn’t use it. Also, there are lots of fiddly rules applying to different countries / dates / seasons / diplomacy which were hard to remember and involved lots of looking up – speaking personally, even if I played the game a lot, there’s no way I could ever internalise all of them. How necessary all that chrome is and what it adds to the game is open to question – there are even optional chrome rules which would lengthen the game even further – no thanks. My problem is that a 2 day gaming window comes around once every couple of years and if asked would I spend the next one playing Europe Engulfed I would have to say “no”. The attraction for me was that here is a simulation of the entire war in Europe and I thought from my reading that playtime was in the 10 hour bracket – well, not for us it isn’t – that isn’t the fault of the game, but for us it’s an issue. 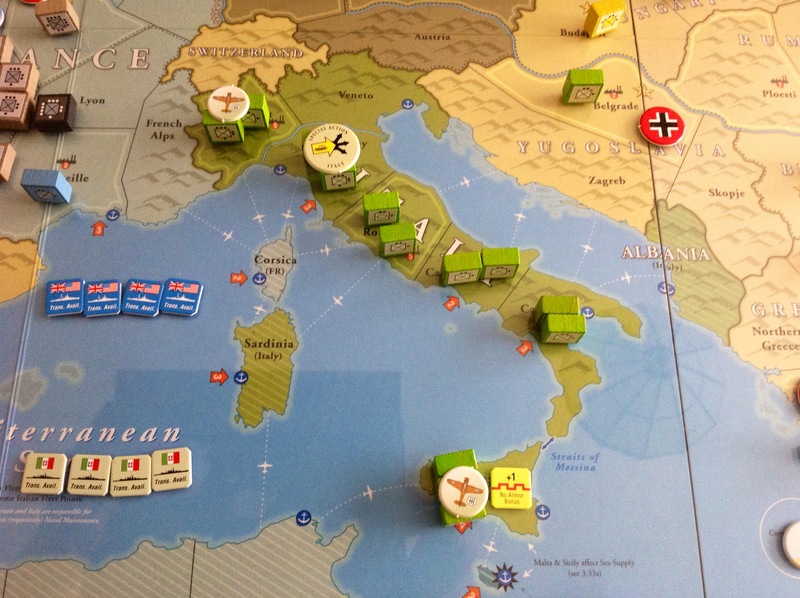 However, apart from the time and chrome issues, it is a fine game and I do like the mechanics, some of which have made it into the more playable (time-wise) Fast Action Battles series – in fact the next game up face-to-face will be FAB: Sicily – really looking forward to that in a couple of weeks time. I would recommend Europe Engulfed heartily, but only if you have the time and the space to leave it set up – and it does look great on the table, doesn’t it? Thats looks a very nice game but that is is indeed epic play time (though to be fair I have lots of lengthy games) !!. Have played this game about a dozen times and it is quite addictive. I have seduced quite a few pals into playing it and they have become even more keen on it than me. 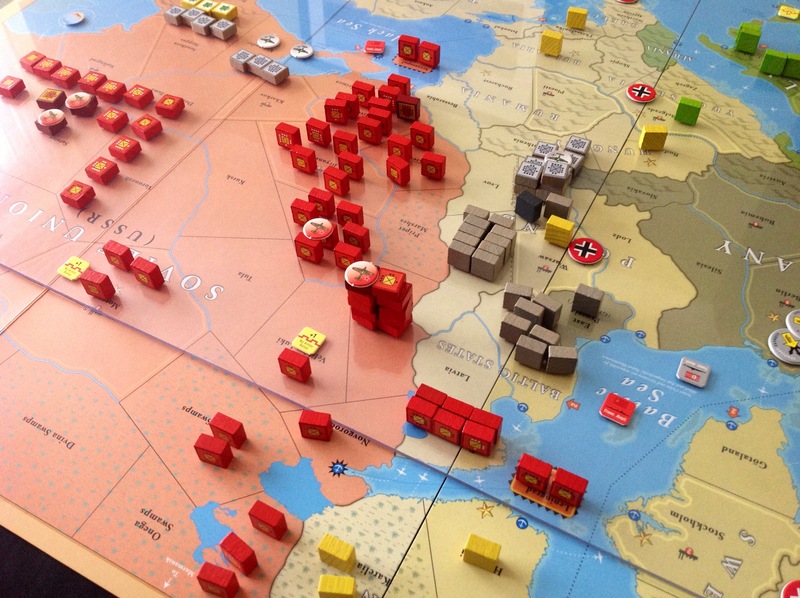 We usually play the 1939 scenario – the whole war. It always seems to take around three days to play, often spread over a couple of weeks or more. Great fun if you have the time!